Get a head start on RTML with our RTML Mega Pack! 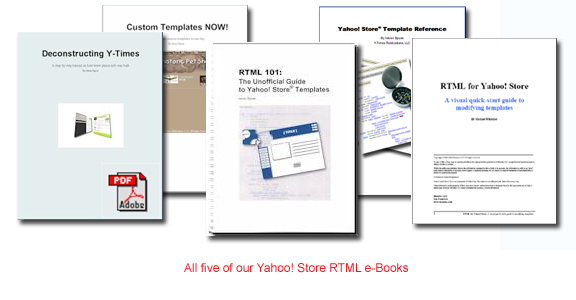 This package includes all five of our Yahoo Store RTML eBooks. The first and only book covering all aspects of working with and creating custom Yahoo! Store templates. A case study detailing how www.ytimes.info was first built using completely customized Yahoo Store templates. 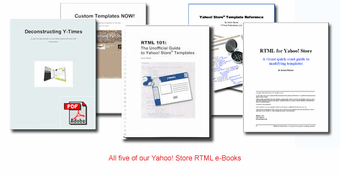 A visual quick-start guide to RTML and custom Yahoo Store templates. Interactive e-book explaining how the built-in Yahoo Store templates work and what they do. Get all the books and get 15% off the total if the books are purchased separately. Please note: because this bundle contains electronic publications, like most organizations selling e-Books, including Amazon.com and Yahoo! Shopping, we cannot offer a refund on those products. The e-Books contained in this package require the Adobe Acrobat Reader version 5 or higher available free of charge at www.acrobat.com. Very well written, easy to understand and thorough! This is must-have material for a Yahoo store owner. Thank you for the RTML Mega Pack .The price was right.And now i can hopefully build a much better store.Yahoo standard templates just don't work for me.Thanks again.